Home / Opinion / Here's an information you need to know | Basic Primer on Federalism: "Self-rule and shared rule"
Here's an information you need to know | Basic Primer on Federalism: "Self-rule and shared rule"
This Federalism primer written by a staunch President Rodrigo Duterte ally strikes a clear analogy for what a federal government is like. “One can think of a neighborhood association wherein families or homes are independent of one another and yet form one association that takes care of common concerns such as security and garbage disposal,” Jhuztine Onardem wrote. The whole article sought to answer one question amidst all the controversy and clambering: What is federalism? Duterte seeks to institute a new kind of government as a key to sustainable national development. Federalism is a form of government where governance is distributed among the Central Authority, called the Federal or National Government, and local government units (LGUs) called Regions or States. These LGUs have a level of autonomy to pursue their “economic destinies” and establish their own legislative bodies and supreme courts, among others. In contrast, democracy is a unitary form of government where the whole country is governed by one National Government and the LGUs remain answerable to the former, as a local franchise to its main company. Through a federal government, the President envisions that de-centralizing State power into regions or states will allow bigger funding for LGU, eradicate corruption, eliminate bureaucratic greed, and bring true peace to Mindanao. 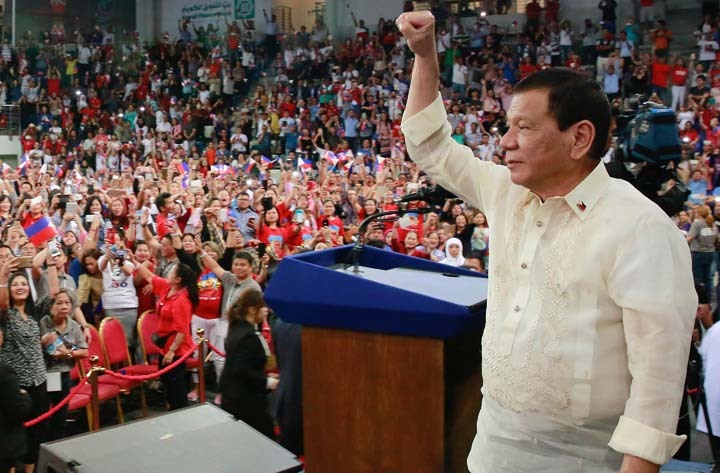 While there are many forms of federalism, the one that Duterte seeks to implement is a Federal-Presidential Model patterned after the US Federal System where a President, Vice President, and two chambers of Congress will be nationally voted for. How the archipelagic Philippines will be divided is another point of contention with some saying to divide it by states (Luzon, Visayas, and Mindanao), others by regions, and others by provinces. In order to transition into this new form of government, a Constitutional Change or Cha-Cha is needed, and there are three ways to achieve this. First is by having Congress call for a Convention. Another is by having two chambers of Congress constitute their selves into a Constitutional Assembly. Last would be having the people propose a “people initiative”. Once the Constitutional amendments are made, it is then submitted to a Plebiscite. Currently, the nation has a Consultative Committee and it is set to present the proposals in a Plebiscite by October this year. There are currently 27 federations worldwide, and while the Philippines is facing a potential transition, the Federalism primers posted by Onardem urged citizens to partake in discourse, be informed, be discerning, and actively participate in the discussions and debates. ITO BASAHIN NINYO KUNG SINO ANG HINDI PA NAINTINDIHAN ANG FEDERALISM. HOW DOES THIS DIFFER FROM WHAT WE HAVE NOW? For centuries now, the Philippines has been structured around a Unitary form of government. In this set-up, the whole country is regarded as one, united, and undivided political unit. Running the country is the National Government where great power, function, and responsibilities are concentrated. However some political as well as economic powers and functions have already been devolved or delegated to lower levels of governments or local government units—Provinces, Cities, Municipalities, and Barangays. These units, nevertheless, remain dependent on and answerable to the national government like a local branch or franchise of a company to its national office. ARE THERE MANY KINDS OR FORMS OF FEDERALISM? Federations or Federal Countries can vary on the basis of the purpose for which states come together. The purpose can be cultural in which states or provinces are formed based on ethnicity, religion, or language, such as in the cases of Canada, Spain and Belgium. Or the purpose can simply be territorial, the states being contiguous or adjacent to one another, such as in the case of the United States of America. Secondly, federalism can also vary in terms of the form of government that the federation adapts. It can be Presidential where the President who is the head of government is popularly elected, or Parliamentary where a Prime Minister is the head of government and is selected by the Legislative Assembly, that is the Congress or the Parliament. Third, federalism can vary in terms of the kinds of power that the Federal Government shares with States or Regions. In some models, States have legislative power, that is, they can enact or their own laws, while in other Federations, States merely have administrative power, that is, they only implement or execute laws. WHICH COUNTRIES HAVE ADOPTED FEDERALISM? There are at present twenty-seven (27) functioning federations around the globe, which encompass over 40 percent of the world’s population. Among the well-known ones are the United States of America (Since 1789), Canada (1867), Germany (1948), Switzerland (1848), Argentina (1853), Russia (1993), Australia (1901), India (1950), and Malaysia (1963). WHAT KIND OF FEDERALISM IS THE CURRENT GOVERNMENT PROPOSING? The Consultative Committee, which was formed by the President to study the Constitution and propose the changes needed for a Federal form of government, has suggested the Federal-Presidential Model. Patterned after the US Federal System, under this model, the country will continue to elect the President and the Vice-President as well as the two chambers of Congress. territories. At one end of the pole, some suggest three States (Luzon, Visayas, and Mindanao), while at the other extreme, some suggest 81 States following the existing 81 provinces. WHY IS THE CURRENT GOVERNMENT PROPOSING THE CHANGE TO FEDERALISM? In speeches then and now, President Rodrigo Duterte has cited various reasons for the urgency of the country’s shift to the Federal System of government. First, the share that Local Government Units (LGUs) are getting from the National government in Manila is a “pittance,” compared to the amount that the former turn over to the latter. He cites, for example that Davao gives P5 Billion a month, but only gets P2 Billion in return. As a matter of fact, LGUs are allocated only P40 percent of the total taxes collected by the Bureau of Internal Revenues. If Federalism is adopted, he says, all this will be reversed, with each LGU retaining 70 percent of its income and remitting only 30 percent to the Federal government. Second, President Duterte also bemoans that the current Unitary System, with powers centralized around the National government in Manila, has been prone to corruption. Only the President in Malacanang and his allies in Congress decide on how the budget is distributed and much of that goes to their pet projects and their pockets, he says. WHY ARE SOME SECTORS OPPOSED TO THE FEDERAL FORM OF GOVERNMENT? First, decentralization, which is supposedly the primary benefit of federalism, is not, in fact, guaranteed by federalism. Dr. Cielito Habito, former NEDA chief writes: “The first point is that federalism does not equate to greater decentralization. There are federalized governments that are less decentralized than unitary ones, and prime examples lie right next to us. Malaysia is described to have a centralized federal system where the constituent states play relatively limited roles in relation to the center. On the other hand, Indonesia has achieved highly decentralized governance under its unitary presidential system. Second, there is great concern that Federalism will lead to greater division and chaos in the Philippines. It is feared that political dynasties and warlords will further be entrenched in the new States or Regions. The Ateneo School of Government estimates that four out of five of the current members of Congress belong to political families or dynasties. According to Professor Roland Simbulan of the Center for People Empowerment in Governance, “there are 178 dominant political dynasties in the Philippines, wherein the 94% of our provinces have political dynasties (73 out of a total of 80 provinces).” It is feared that it is these powerful dynasties that will lord it over the new political dispensation. Third, the division of the country into various states could become troublesome. Richer provinces will not wish to be joined with poorer provinces. With States or regions left to fend for their own, they can develop unevenly, with some growing richer and others poorer. Finally, even as the government touts Federalism as the ultimate solution to the separatist desires of Muslims in Mindanao, this may not be that simple. The failed experiment in the Autonomous Region for Muslim Mindanao (ARMM) proves this point. The proposed Muslim State also fails to appreciate the fact that there is no one Muslim nation but probably nations. HOW DO WE TRANSITION TO THIS FORM OF GOVERNMENT? What is needed for a shift towards Federalism is no less than a Constitutional Change or Cha-Cha, because the shift would require extensive, radical, and wide-ranging changes in the country’s political system. There are three ways Constitutional amendments are undertaken. Firstly, Congress can call for a Convention, or secondly, the two chambers can simply constitute themselves into a Constitutional Assembly. Finally, the people themselves can propose to what is called a “people initiative.” Whichever is taken, the amendments must be submitted to a Plebiscite. Currently, the Administration has appointed a Consultative Committee to propose the Constitutional amendments needed for a Federal shift. Although, the House of Representatives and the Senate are at odds whether to call for a Constitutional Convention or to constitute themselves as a Constitutional Assembly, the proposals of the Committee are set to be presented in a plebiscite this October, simultaneous with Barangay and Sangguniang Kabataan elections. WHAT IS THE POSITION OF THE CHURCH ON FEDERALISM? First, as a general rule, based on its long tradition of Catholic Social Teachings, the Church does not favor a particular political system over another. It has of course shown preference for Democracy as this allows for the establishment and protection of freedom and human dignity, which are values that the Church espouses. Second, on the issue of Charter Change, the Catholic Bishops Conference of the Philippines put out a statement last January, reiterating its support for the 1987 Constitution, and saying that if Charter Change is to happen, the whole process must be above-board and must involve the active participation of the people. Third, in the same statement, the Bishops find the move towards Federalism unnecessary at this point. They write: “We ask the question: is it necessary to change the Charter in order to devolve power? Many constitutional and legal experts do not seem to think so. WHAT CAN WE DO AS CITIZENS IN THIS DEBATE? to pave the way for Federalism, the far-ranging changes will be very hard to undo.